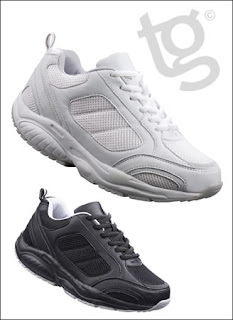 Toning Trainers - designed to give you an extra workout with every step. Toning trainers have an engineered sole to help you improve your posture and fitness levels. Toning trainers are designed to promote stronger leg and gluteal muscles, improve core strength, reduce pressure on joints, strengthen your back, improve blood circulation and improve your overall health and wellbeing. Upper: other materials, inner: textile, outer sole: other materials. Available in a choice of White or Black. Available in Ladies sizes 3- 8.